Order new MeX software and receive 30% off. Attention Existing MeX Customers! Version 6.1 is now available. Remember, all MeX-Professional and MeX-Standard customers with a valid service contract, receive free upgrades! To renew an expired service contract and get the 6.1 upgrade, see options MS-200 and MS-250 in our ordering table below to see what is right for you. The software is self installing and is extremely easy to use. The modular design of the package allows flexibility in use; it also permits users, with a single repetitive task to perform, to purchase modules according to requirements. The analysis modules allow measurement of profile, roughness, area, volume and height. All measurements are traceable, can be calibrated and conform to ISO standards. The performance of MeX has been proved by many customers in leading companies and universities throughout the world providing imaging and analysis previously unobtainable with SEM images. 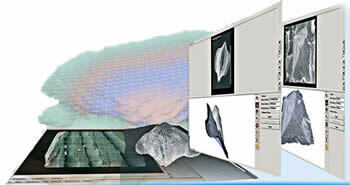 The core of MeX is formed by its innovative 3D reconstruction algorithms. The research and development team of Alicona Imaging have invented methods that generate highly accurate, dense and robust results. This unique performance becomes obvious in images of complex structures with steep edges and drop offs in addition to demanding samples with low texture and signal-to-noise-ratio. This high quality is achieved irrespective of image magnification. Conventional approaches rely on the use of two images. This comes with the major drawback that the overall accuracy of the 3D measurement is partly dependent on the accurate reading of the tilt angle. It is also commonly known that this reading maybe error-prone and can only be achieved to a certain level of accuracy. Latest developments of Alicona have extended this stereoscopic approach to a third image. As a result the user defined parameters, such as the tilt angle, are automatically calculated. This omits the influence of the user and allows, for the first time, traceable 3D measurement in the SEM. The uniqueness of MeX is in its accuracy and robustness. But in order to perform appropriate measurements, beyond conventional visualization, analysis following international standards must be available. In MeX, the easy to use, roughness and area analysis are provided to EN/ISO standards. Measurements are performed directly on the SEM image. Printing and exporting the actual representations of an image are a one-click operation. The visual link between the surface and the image enable precise and flexible measurements. Even volumetric analysis is conveniently feasible. Therefore MeX is the only software package that turns a SEM into a true 3D metrology device. No additional hardware is necessary to run MeX. As a pure software solution MeX can be operated with any SEM requiring only images in common formats. The software is self-installing and works completely independently of any third party drivers or components. The user interface of the overall package is very user friendly and self-explanatory. Data is obtained quickly and effectively. A wizard guides the user through the reconstruction process which then automatically converts the information to a 3D data set. The consecutive analysis is again intuitive and the user is not confronted with unnecessary functionality. The user finds exactly what is expected from a 3D metrology package. The image formation process in the SEM is based on perspective projection. Similar to a conventional light microscope the three dimensional object is projected onto a two dimensional image plane and information about the third dimension is lost. Note, the large depth of focus in SEM provides full depth of focus images, but does not allow to measure depth. Only two dimensional measurements in the image plane are feasible. An eucentric tilting of the stage, meaning that the intersection of the primary electron beam with the specimen define the centre of tilting, yield a second image of the specimen observed form a different viewpoint. A so called stereoscopic image is generated. Overlay techniques such as red-green coloring provide anaglyph viewing and thus depth perception but again no quantitative analysis. The leading technology of Alicona now automatically identifies points in each of the images that belong to the same point on the specimen. From theses so called homologous points the true three dimensional coordinates of the observed point can be recovered. This demanding task is robustly solved for each pixel in each of the images and thus a dense 3D model of the specimen is obtained. An additional third image captured from a third tilt position allows to automatically refine given calibration data. Thus traceable results are obtained. Height measurements with the AutoCalibration can be verified using a micro-contour-artefact that is calibrated by the PTB (Physikalisch Technische Bundesanstalt, Braunschweig). The depth measurement standard from the PTB contains grooves of different depth (from 240nm to 50µm). The unique AutoCalibration works fully automatically. Alicona is the only supplier able to offer this technology. 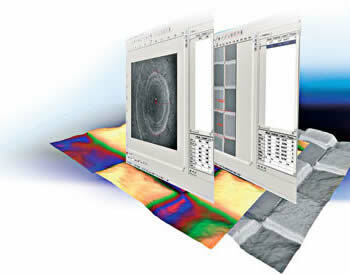 MeX is the only real metrology package that allows numerically accurate measurements independent on the magnification. 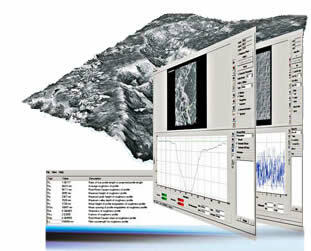 MeX allows extended analysis features such as ISO conform roughness analysis and extended form analysis. Please note, this is for information only. This standard is not purchasable from Alicona. Measurements of the pure software solution MeX can be verified using a micro-contour-artefact that is calibrated by the PTB (Physikalisch Technische Bundesanstalt, Braunschweig). The artefact contains different regions including steep flanks, height steps and cylindrical elements. The 2D image analysis allows the performance of manual and semi automatic measurement of simple primitives. Also, the ability to write on the images as well as saving measurement results in a comprehensive and easy to use database is provided. Area analysis provides the determination of Ra, Rq and Rz. Parameters like roughness, waviness and the fractal dimension of user defined surface patches are achieved. The user defines a region of interest such as a rectangle or polygon and MeX automatically calculates the values. For the visual representation of the surface a grey scale or pseudo colored depth map can be used. It is also possible to display ISO-lines to highlight depth variations. Profile measurement enables virtual cutting of specimen. The user defines a path on the optical image and receives the corresponding 3D profile. Roughness and contour measurements conform to recognized EN ISO 4287/4288 international standards. The profile analysis also allows the fitting of primitives such as circles, angles or others. Further, manual and semi automatic measurement possibilities are provided. Volume analysis calculates the volume of voids and protrusions. The measurement area is defined directly on the optical image. The volume is determined throughout the computation of a soap film model. 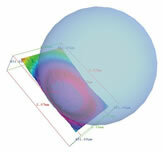 For the 3D-boundary of the selected area MeX calculates a covering surface that behaves like a soap film. If required, a component can be measured in 3D from different perspectives. Measurements from various positions are automatically merged into a complete 3D data set. The "Real3D" technology allows the component's visualization from different angles plus a measurement of contour, difference to e.g. measure wear, and form. This way, surface parameters such as undercuts that are normally difficult to access are measured quickly and effortlessly. Contour Measurement – Users measure angles, distances, circles, incircles, circumcircles, thread pitch etc. from every position. 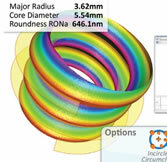 In addition, the contour measurement module includes roundness measurement. Difference Measurement – Difference measurement is used to numerically compare two different geometries. Form Measurement – Automatic fitting of spheres, cones and cylinders allow the visualization and form measurement of tools and other components. Profile-Form Measurement Height steps, radii, angle measurement etc. 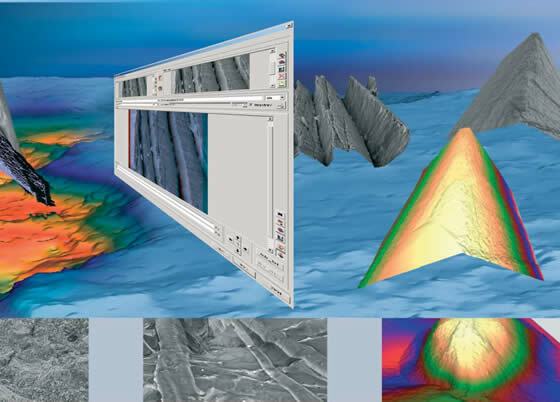 Quantitative surface analysis with the SEM is often used to investigate damage evolution in materials in addition to assisting in the design of more fracture resistant materials. The optimization of materials is complicated by the fact that the material properties may need to vary locally within the component. An example of this is cutting tools that need to be very hard at the cutting edge but be tough in the interior of the material. MeX is used to study deformation and fracture behaviour to optimize the performance of inhomogeneous materials. Dense, robust and accurate 3D reconstructions are created to allow measurement of fracture surface profiles, roughness parameters and fractal dimensions. 3D measurement results computed by MeX lead to significant understanding of parameters such as fracture toughness, crack growth and propagation or fracture resistance. MeX turns any SEM, in biological and non biological applications, into a full 3D measurement device. Until MeX, the biological user has had limited methods that could provide accurate and robust measurements of surface texture, volumes and area of bulky irregular samples. In recent research MeX has been used to characterise the topography of the extracelluar matrix (ECM) underlying colon cancer cells at various stages. Also, the enhanced visualization and roughness measurement capabilities of MeX has provided additional information, not previously available, about the cancers' behaviour. These findings have implications not only for improving the general understanding how colon cancer and metastasizes grow, but, also lead to a better understanding of the role of the ECM topography in cancer. MeX can be used for the measurement of diameters, depths, angles of slope and volumes of craters created by impact of mineral grains on metals. This is part of the calibration work that has been done to help interpret cometary dust impacts on the stardust spacecraft, which returned to earth recently, carrying the first comet samples ever collected. MeX has been used as a measurement tool to interpret the size, density and composition of particles responsible for making micrometre-scale craters. The ease of use of MeX, with its intuitive graphical interface, has enabled the quick and simple measurement of the required parameters. Data input and the range of easily interpreted reconstructions make MeX to a most suitable tool for quantified reconstruction of crater shapes from tilted stereo-pair electron micrographs. Every gun leaves distinctive marks and traces on the bullet cartridge and projectile, similar to fingerprints. These traces on a gun, found at a crime scene, can be instrumental to prove guilt of suspects. Conventional methods are based on the analysis of 2D images to identify which bullet has been fired from which weapon. However, the 3D visualization and measurement of the firing pin and cartridge indentation is far more precise. It is here that MeX offers unique capabilities providing a highly accurate, dense and robust 3D reconstruction with full depth of focus taken over a large field of view. Using MeX a user can, for example, measure the volume of a firing pin impression along with profile that can be related directly to the firing pin. This leads to a numerical evaluation independent from any subjective point of view, providing rapid and understandable analytical data for interpretation. Modern high-tech steel is one of today's most important materials in all kinds of industries, transportation or medicine. The surface characteristics can relate to appearance, conductivity, corrosion resistance, wear or many other properties. MeX is an essential tool to assist with surface characterization for quality assurance and failure analysis. The 3D measurement capabilities provide robust and accurate results on properties such as fracture and compression strength, notch bar impact value or creep strength. 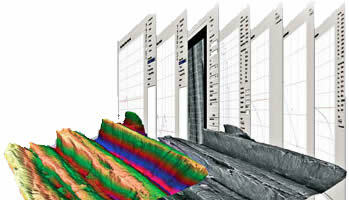 MeX is also used to evaluate faults in steel production. The overall quality of steel is dependent on the topography of the roller used in its production. As soon as the roller exhibits any kind of surface defects the surface of the steel will show dimples and inclusions. Using the measurement capabilities of MeX these faults can be analysed and the source of the defect traced. MeX turns any SEM, in biological and non biological applications, into a full 3D measurement device. Until MeX, the biological user has had limited methods that could provide accurate and robust measurements of surface texture, volumes and area of bulky irregular samples. In recent research MeX has been used to characterise the topography of the extracelluar matrix (ECM) underlying colon cancer cells at various stages. Also, the enhanced visualization and roughness measurement capabilities of MeX has provided additional information, not previously available, about the cancers´ behaviour. These findings have implications not only for improving the general understanding how colon cancer and metastasizes grow, but, also lead to a better understanding of the role of the ECM topography in cancer. 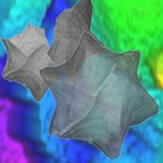 Please contact Electron Microscopy Sciences for an evaluation of the MeX Software. We can setup an account on the Alicona web site for the evaluation.